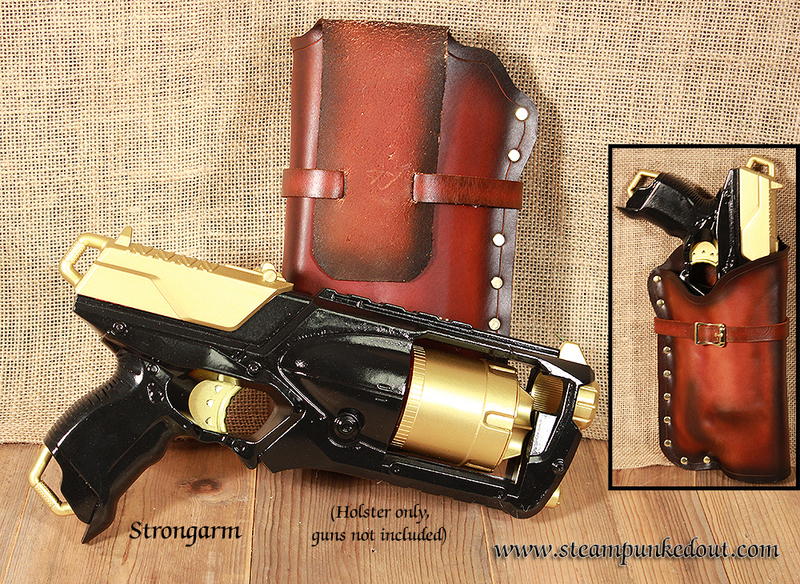 Modding Nerf guns seems to be a right of passage for many steampunkers. Now you can carry your modded masterpiece at the ready! 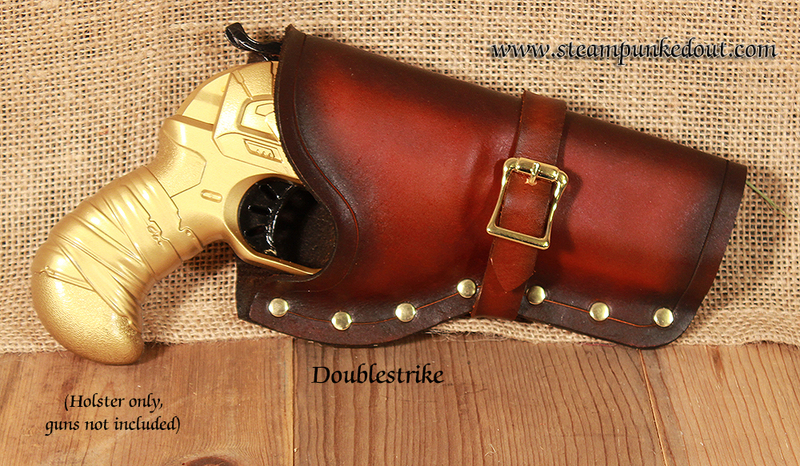 The western styled Nerf holster is simple and efficient. 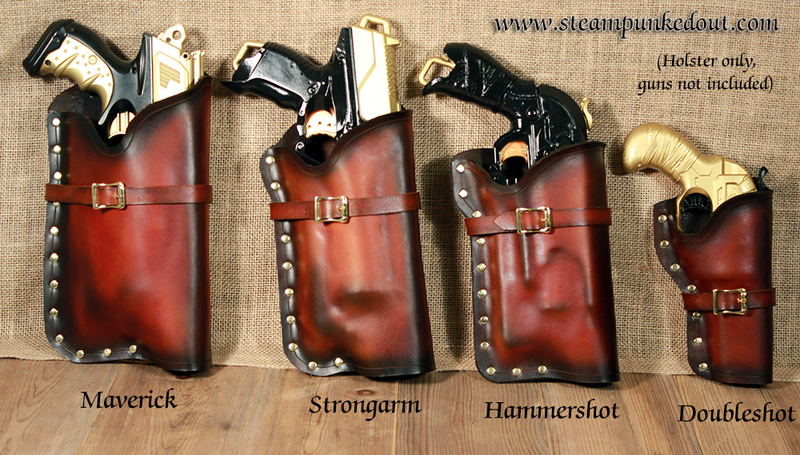 They are based on the same idea as the fold over style holsters used for the real thing. 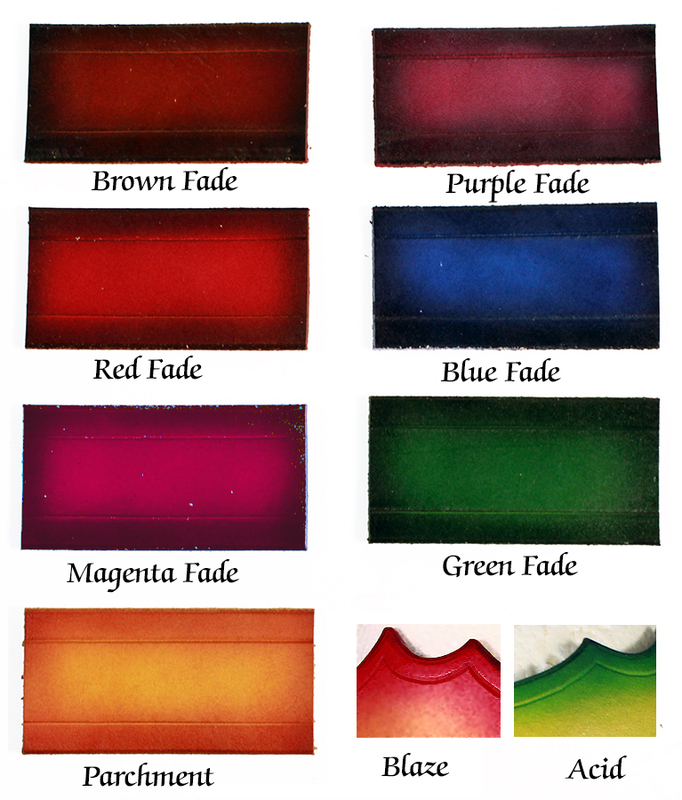 This makes them versatile for use on holster drops, and short and long belts. 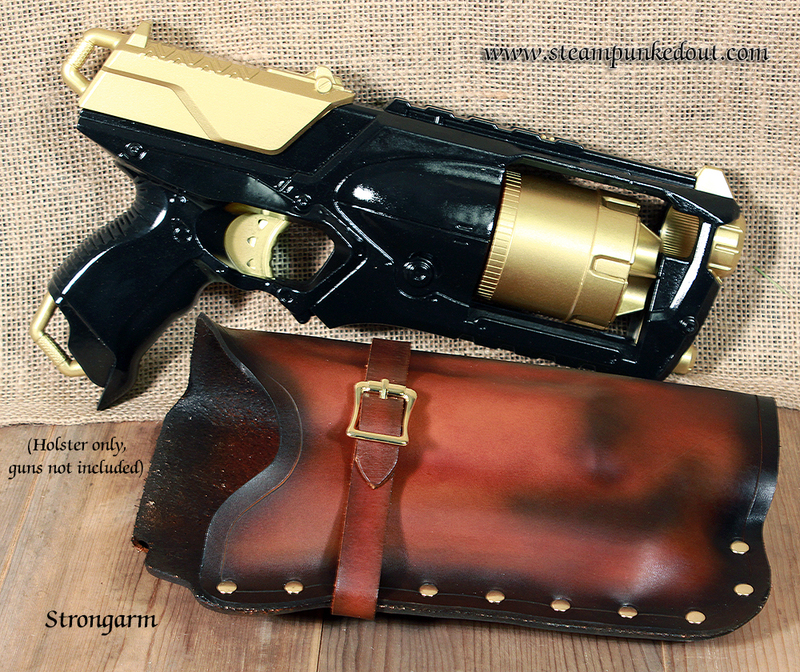 Current stock models are available for the Maverick, Strongarm, Hammershot, and Doublestrike. 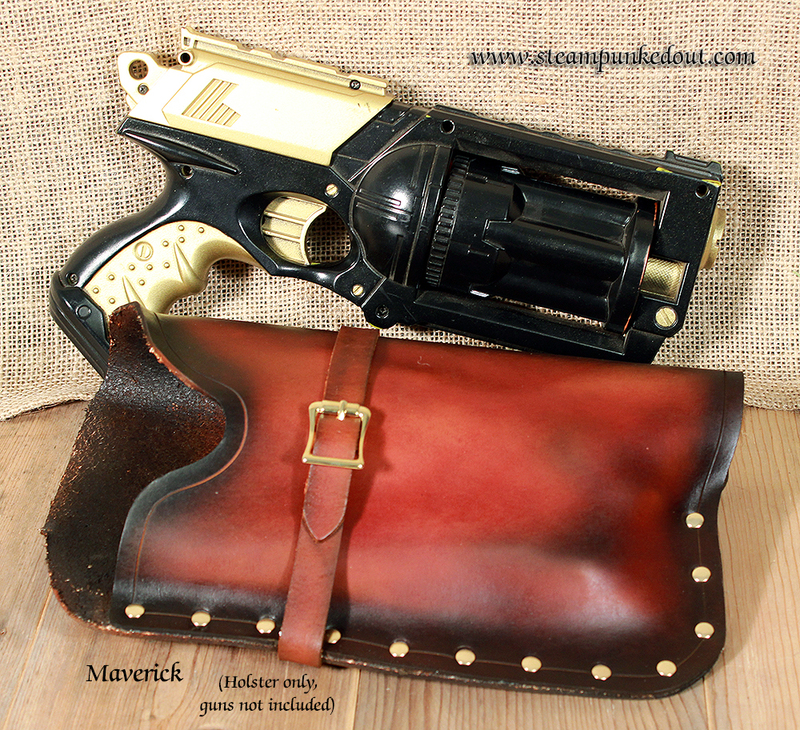 Custom holsters can be made for many Nerf guns. 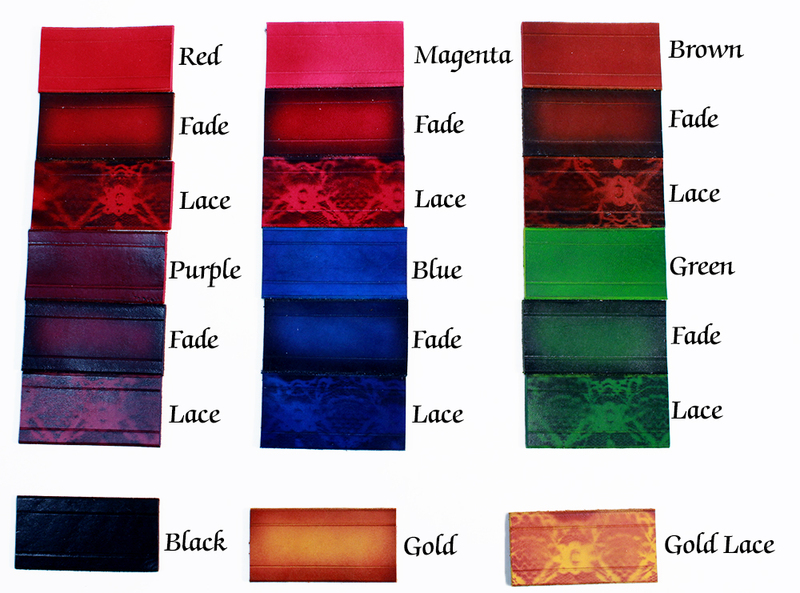 Please contact me for custom holster quotes. 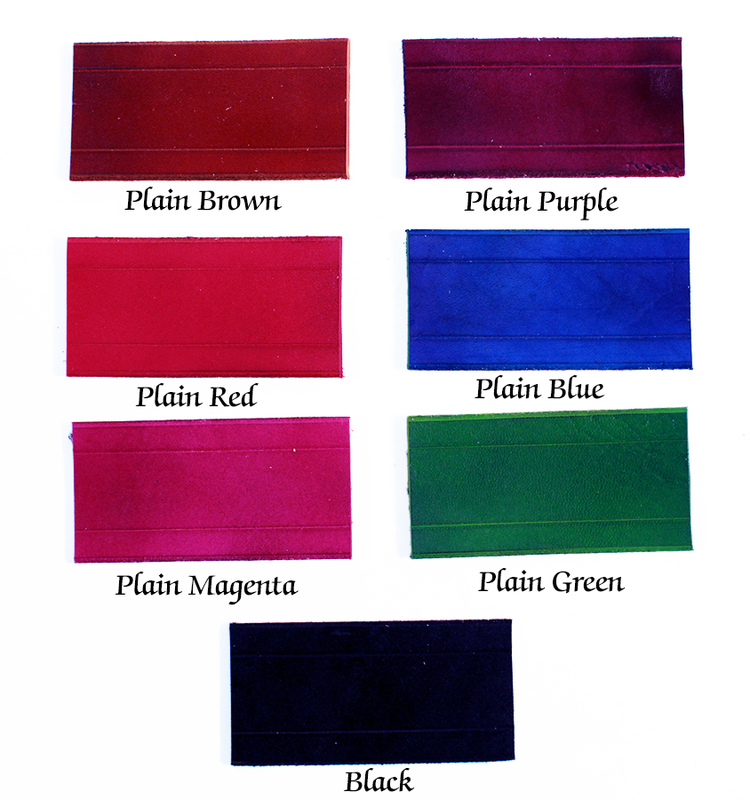 The holster is made from 5-6oz veg tan leather with a simple gear impression or plain with no gear, and finished with choice of black, plain brown, or antiqued brown dye. 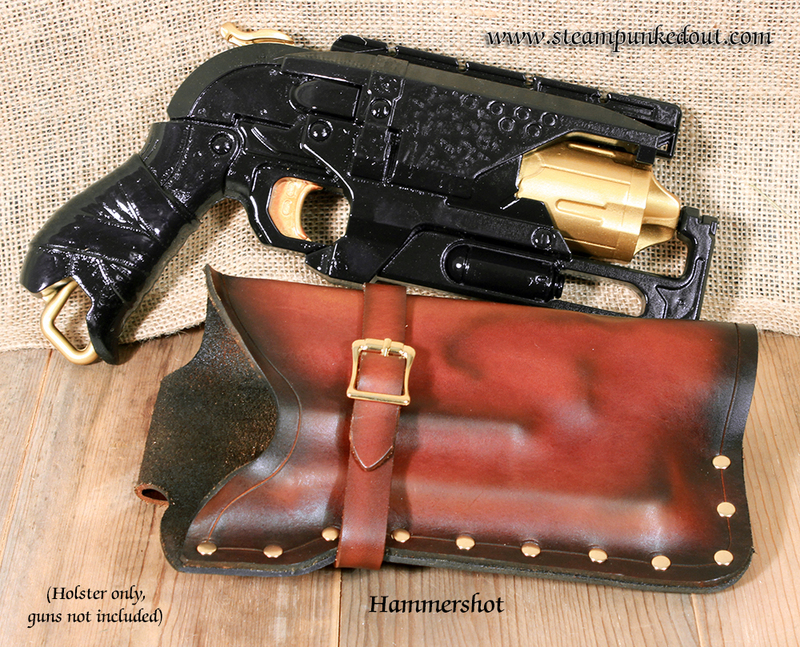 The holster is a 1 piece design that is folded over in 2 places (once along the barrel to make the holster, and once at the top, making the backing loop ). The belt loop easily fits up to a 2" belt. 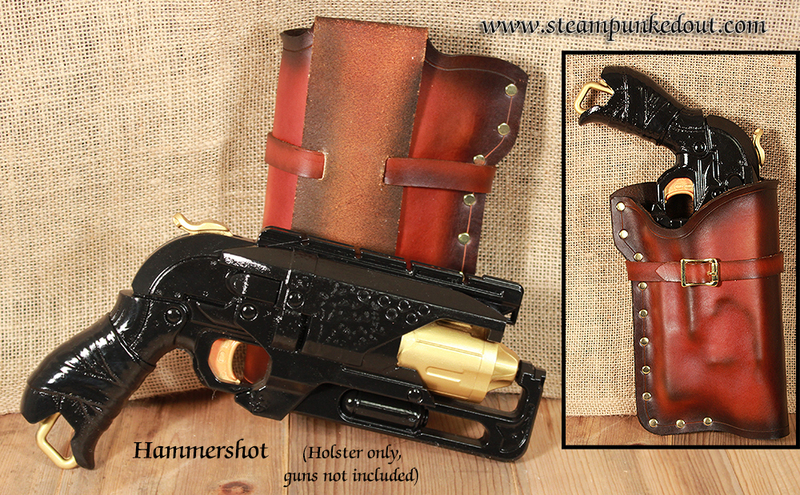 Please note these holsters are intended to fit the Denix Replicas shown in the product photos. 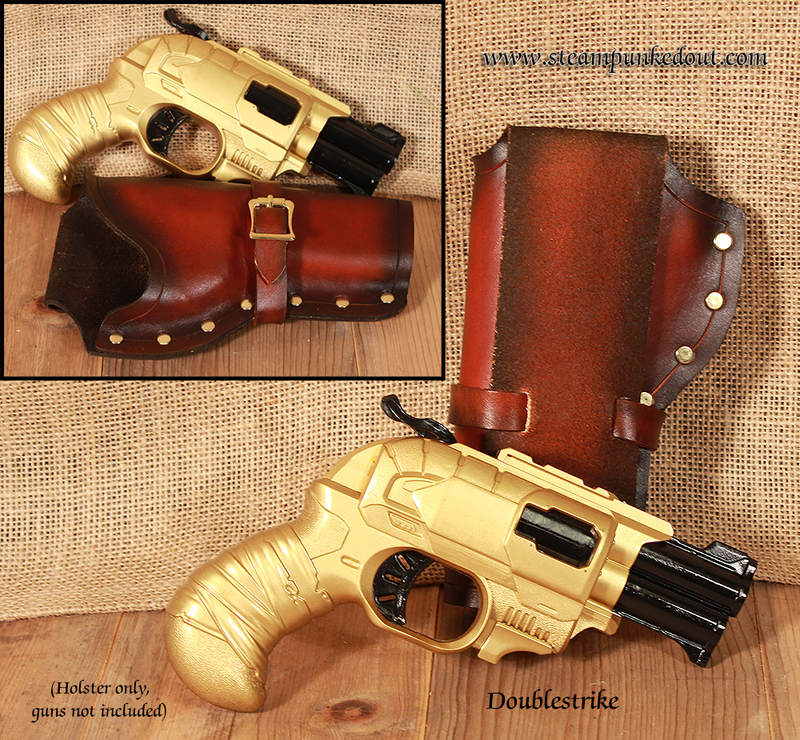 While many of the replicas are the same size as real weapons, it is not likely to fit real firearms or function properly for real world use. Please contact us before hand when considering holsters for real firearms to discuss custom fitting and heavier weight leathers. 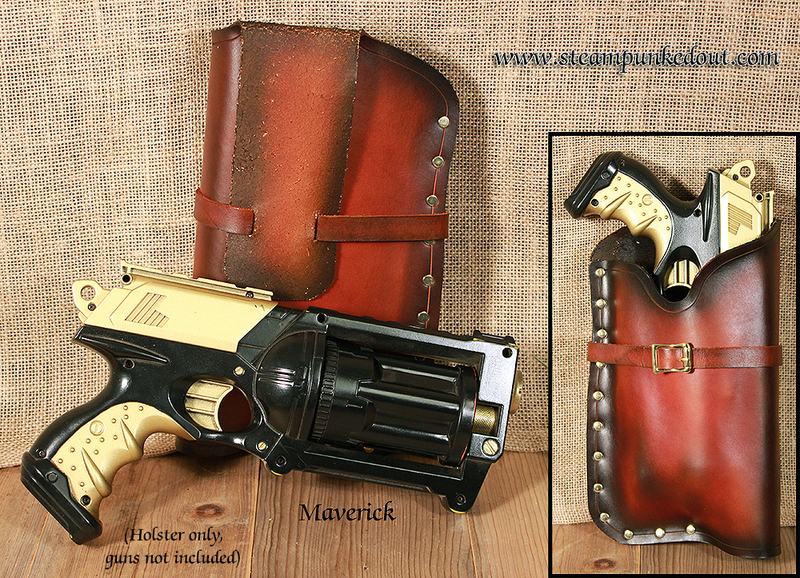 No refunds can be offered for holsters purchased to be used with any guns (real or replica) not pictured above. 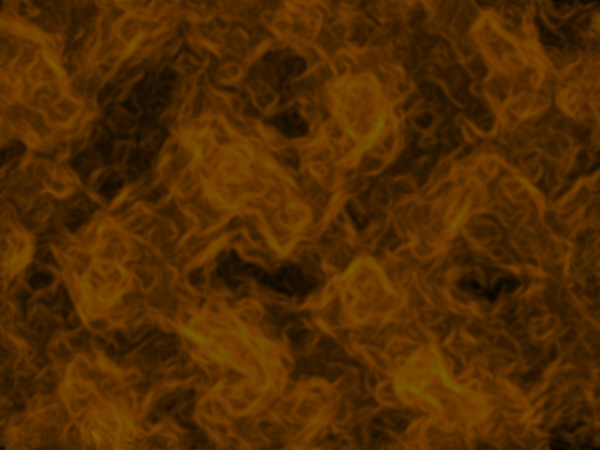 For more info, please see out FAQ.